Have I mentioned my addiction to Pinterest? I got this awesome idea from a pin someone had posted linking to the Martha Stewart site for Petit Collage. Cute additions to a nursery or a gift for anyone with kids. 1. Download and print out the templates for the owl and the elephant from the site. 2. Gather scrap paper. Make sure its not too heavy (e.g card paper) or the glue won’t work and not too thin (tissue paper) or the glue will make it transparent. Remnants of gift wrap, insides of envelopes, whatever takes your fancy. 7. When totally dry give it a final coat of mod podge to seal and its ready to hang when dry! Sounds yummy right? And they were…. finished in the blink of an eye! Thank god they are quick and easy to make. I started to follow this recipe but as usual deviated and ended up with my own recipe as below. 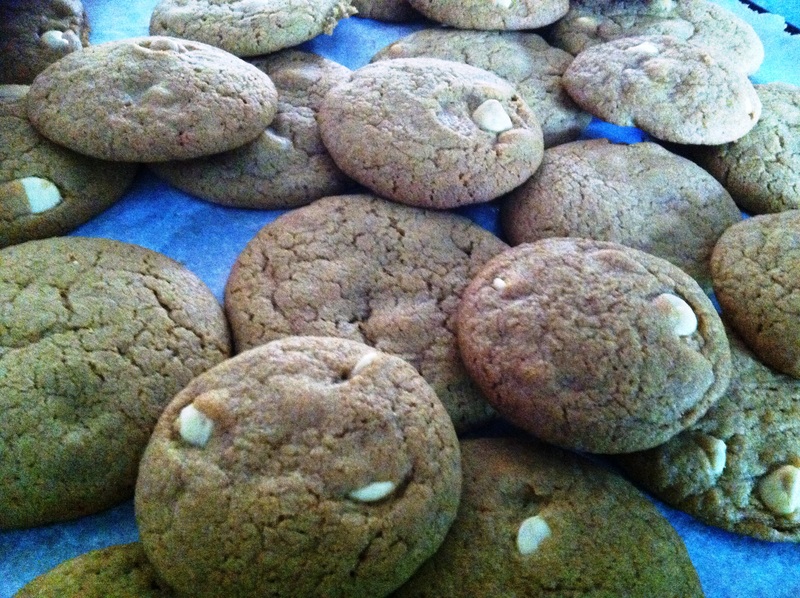 Makes about 24 medium sized cookies. 1. Preheat oven to 160°C. Line 2 baking trays with non-stick paper. 2. Beat softened butter, brown sugar and 1 tsp vanilla extract for 1-2 minutes or until smooth and well combined. 3. Beat in 1 egg. 4. Stir in plain flour in two batches. Stir in milk choc bits until evenly distributed. 5. Spoon tablespoonfuls of the mixture into balls and place on the lined trays. Press down slightly. 6. Bake for 15-18 minutes or until light golden and cooked. 7. Transfer to a wire rack to cool. They will be soft to touch till they are completely cooled. From ‘Hello’ to ‘Hell No!’ … Cyberbullying – are you being affected? I count myself as one of the very few blessed souls that was neither too smart nor too dumb; too fat nor too thin; nor out of the ordinary in any way, to ever become the target of a bully. I will however ashamedly state that I have at two points in my life teased my fellow students. I say teased because they were one off incidents and I by no means see myself as a bully. The other party may have a differing view. Personal experience aside, two things have led me to write this piece, one was this youtube video and the 11th episode of Big Bang Theory season 5 (The Speckerman Recurrence). Bullying is a part of life, whether the bully is your sibling, the lasting bitter taste of a fellow school mate or a good friend who thinks he is being helpful. Most of us are told to ‘man up’, ‘grow a pair’, ‘stop being a sissy’ and ‘stand up for yourself’. But when does bullying become too hard to handle? Bullying has always been a concern amongst adolescents. With the developments made in technology, this form of aggression has progressively transferred to an online medium. In a study conducted in 2007, an astonishing 32 percent of adolescents in Canada have experienced at least one account of online aggression (Media Awareness Network, 2010). When almost one-third of a western country’s adolescent population experience something, it becomes imperative to find out just what it is and why it’s happening. Bullying, refers to repeated acts of causing intentional harm to a victim as a result of a power imbalance. It occurs within a familial or social context when one sibling or classmate has the intellectual or physical upper hand over the other. This upper hand is then expressed through intimidating or humiliating behaviour at home, at school and various other places where others are present to witness the victim’s degradation and further add to the impact on the victim. Jonah and Leonard both show signs of depression and timid behaviour as a result of face to face bullying. If they are eventually vocal about it, it’s either out of helplessness or due to distance and maturity. But there are many victims of bullying out there who suffer in silence – especially now that bullying has gone online. Cyber bullying is a form of aggression which entails the intention to harm someone who cannot defend themselves through an electronic medium. Cyber bullying can be exhibited through various means; it can include threatening someone through instant messaging or chat rooms, or embarrassing them through social media including Facebook and MySpace. In contrast, a traditional sense of bullying refers to intentionally and repeatedly harming someone in a face-to-face interaction, that generally takes place in or near schools. 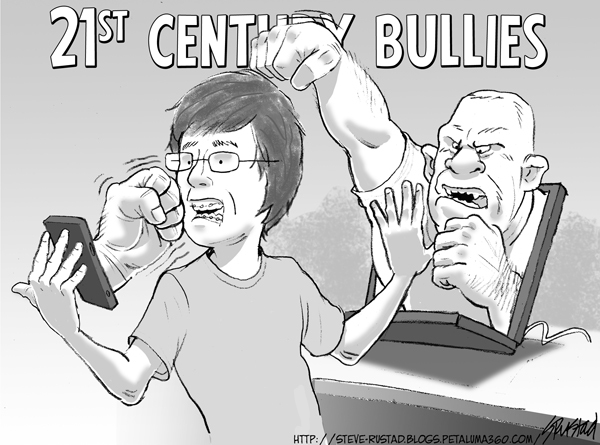 Cyber bulling is distinguishable from the traditional sense because it takes place in an online environment. Bullies express themselves in a way they would normally refrain from doing so, as they are able to use a medium that allows them to act aggressively without immediate repercussions. Studies have shown that technology provides bullies the potential to be more viral than traditional bullying, since threatening or embarrassing messages can be exposed to a large audience virtually instantaneously, through means such as mass emails and posts. Cyber bully victims were almost twice as prevalent to attempt suicide as those not bullied at all; victims of traditional bullying, on the other hand, were 1.7 times more likely. Although not significantly greater than the traditional form, these rates demonstrate the impact that cyber bullying can have on an adolescent. When victims are harassed by bullies, they experience feelings of decreased self-worth, depression, loneliness, and hopelessness, all of which contribute to greater risk of suicidal thoughts and attempted. With communication becoming vastly technologically advanced, most online communications allow for the use of a pseudonym, enabling a sense of anonymity amongst users. The use of pseudonyms provides people with the opportunity to separate their real-life identity and their “online” identity (Mason, 2008). Accordingly, some individuals feel a sense of liberation and behave in a way that would otherwise be considered socially inappropriate. They are more likely to act aggressively by being more spiteful, vicious, and threatening. These actions can be contributed to what is known as disinhibition effect, which suggests that as a result of anonymity deriving from computer-related modes of communication, people are less likely to be concerned about the society’s reactions. They ultimately feel empowered to express themselves openly without worrying about consequences. The effects of disinhibition are said to be caused by deindividuation, which occurs when one’s accountability cues have been diminished. Anonymity reduces one’s self-awareness and makes them more likely to act based on situational cues. Research shows that uninhibited communication such as use of profanity and insults were significantly more prevalent in computer-mediated communication than in personal interactions involving face-to-face interactions. As a result of the reduced influence of social norms, antinormative and deregulated behaviour such as aggression are more common. Accordingly, the importance of anonymity as well as the deindividuation effect significantly contributes towards occurrences of cyber bullying. Cyber bullying is often more dangerous than traditional bullying as it can be perpetrated by strangers. The online medium provides an anonymity which empowers bullies into targeting innocent victims. This is especially the case when people go online looking for love. Increasingly someone knows someone who met their perfect match online and more and more vulnerable lonely hearts are exposed online. These lonely people are emotionally vulnerable and a prime target for scams. There have been many stories like this one of women who have been cheated out of their finances by men who flirted their way into their lives and then pleaded for financial assistance. Women who lose everything but are too humiliated to tell anyone. Contrary to common perceptions it is not only children and teenagers that are the target of cyber bullying. While kids may tease other kids online and teenagers may write unsavoury comments which ‘ruins social lives’, many adults are at risk of being hurt as well. More than 1600 Australians reported losing $17 million in the online search for romance this year, up from $15 million last year (full article on SMH). The influence of anonymity and deindivdiuation in online settings significantly encourages adults and adolescents alike to participate in inappropriate social behavior such as bullying, flirting and fraud. These can be reduced, if not prevented by developing trusting face to face relationships between adolescents and adults including teachers and parents. Bullies (adults or kids) indulge in bullying to increase one’s self-worth while simultaneously decreasing that of others’. Provision of extracurricular activities which promote self-development and esteem can contribute towards decreasing occurrences of cyber bullying in all age groups. Cyber bullying is a sad reality of an increasingly connected society and a greater awareness by parents, teachers and social workers is imperative to introducing measures to prevent bullying related depression, suicide and other misfortunes. Fostering relationships between adults and children means children are less likely to lose their sense of identity in online settings. Providing activities for students to participate in allows better management of stress and prevents students from lashing out at each other. Someone you know may be a victim of bullying or cyber bullying. Be aware of what it is and equip yourself and those you love with the required skills and information to protect yourself. Special thanks to Afnan for letting me use her research! It’s that time of year again! Everyone’s winding down and looking forward to the festive season. But there is one thing I am definitely not looking forward to – the inevitable unwanted guest that comes around every vacation – weight gain. This year I am determined that no amount of xmas candy or end of year parties will make me invite that unwanted guest that ends up extending their welcome. I’ve tried a lot of diets and exercises and the worst thing for them is a big ol’ holiday. Christmas, New Year, Valentine’s Day, Easter, Eid, Diwali you name it we eat for it. Can you imagine any big holiday without food? I love food. I love eating. This is why I can never diet nor have I ever seriously tried to. I believe a balanced diet and moderate exercise should be enough to keep a person healthy. So I’ve collated some tips tricks and myths to help you through the festive season. Stay happy, healthy and enjoy everything in moderation! Food-focused celebrations: We socialise with friends and family using food and drink. And on holidays the availability increases — raising the temptation to overindulge. The pressure to give in can be great, as we don’t want to offend the host and the alcohol served at many social events can also destroy our resolve to eat in moderation. Stress: Holiday obligations and expectations add to the strain of everyday life and the stress can lead to overeating. Emotional eating: Some people use food to soothe sadness, anxiety, dissatisfaction, or loss. Others simply use any celebration as an excuse to overindulge. Also when people who are trying hard to eat healthy fall off the wagon, many get frustrated and give up. Weather: Some people crave high-calorie comfort food and drink in hot weather telling themselves it’s the holidays and its ok. DON’T! You will regret it later. Be conscious of what you eat and how much – Allow yourself some special treats on the holidays but have moderate servings. When there’s a lot of food available, try an appetizer-sized helping of each dish instead of dishing up a full serving. Manage Stress and Emotions – One way to keep stress at a minimum is to lower your expectations about holidays. If you’re sad about a loss, turn to people for comfort instead of food. Eat a little before you go to a holiday gathering; hunger can undo the best intentions. Avoid sources of temptation whenever you can. After visiting a buffet, leave the room that’s filled with food. If there are sweets in the office break room, don’t go there. If you’re given unhealthy food as a gift, bring it to the office to share. Drink one glass of water every hour. It will make you feel full. Drink ice cold water. Your body will burn calories just getting the water to a normal temperature to digest. Also it is great for your complexion. Drink 3 cups of green tea daily. It will help boost your metabolism, plus its anti-oxidants make your skin look great. Take vitamins daily. Do not take vitamins on an empty stomach, otherwise they have nothing to catalyse with. Eat ice or gum when hungry. This will make your body think it had food without the calories. Eat spicy foods. They raise your metabolism. Take cold showers because your body will burn calories to heat you back up. DON’T take laxatives. They don’t help you to lose weight. DON’T use diuretics. They only dehydrate you. Brush your teeth constantly so you won’t be tempted to eat afterwards. Wear a rubber band around your wrist. Snap it when you want to eat. Clean something gross (toilet, litter box, boyfriend’s closet) when you want to eat. You will not want to eat after cleaning a litter box. Use smaller plates and utensils so it seems like you ate more. It takes 20 minutes for the brain to realize the stomach is full. Chew food thoroughly and then take a sip of water between bites. You will feel full quicker and will not eat as much. Sleep at least eight hours a day. If you get less than eight this can lower your metabolism by 15%. Keep good posture, burns 10% more calories when you sit up straight. Make a list of all the “bad” foods that you crave and tend to binge on. Each day, pick one to take out of your diet that you absolutely, no matter what, cannot eat again. Take one off the list each day until there are no more bad foods you can have. Avoid alcohol! A shot of liquor has 100-120 calories, a glass of wine has 80 calories, a lite beer has 110-120 calories, and a regular beer has 140-170 calories. Never eat anything bigger than about a cup, your stomach will expand and then you’ll get hungry more. Wear lip gloss. It makes you more aware of what’s going in your mouth. Also, flavored ones help with cravings. Eat lots of fiber. It makes you feel full and takes fat with it out of your body. The natural cleansing helps improve both your energy level and overall feeling of wellness. Read the nutritional information. Remember, fat-free does not mean calorie-free. Also keep an eye on fiber content. Get as much fiber into your diet as you can, while cutting fat and calories. Don’t eat a lot at once. Spread your food throughout the day. Myth #1: Fad diets work for permanent weight loss. Fact: Fad diets are not the best way to lose weight and keep it off. Fad diets often promise quick weight loss or tell you to cut certain foods out of your diet. You may lose weight at first on one of these diets. But diets that strictly limit calories or food choices are hard to follow. Most people quickly get tired of them and regain any lost weight. Myth #2: High-protein/low-carbohydrate diets are a healthy way to lose weight. Fact: The long-term health effects of a high-protein/low-carbohydrate diet are unknown. But getting most of your daily calories from high-protein foods like meat, eggs, and cheese is not a balanced eating plan. You may be eating too much fat and cholesterol, which may raise heart disease risk. You may be eating too few fruits, vegetables, and whole grains, which may lead to constipation due to lack of dietary fiber. Myth #3: Starches are fattening and should be limited when trying to lose weight. Fact: Many foods high in starch, are low in fat and calories such as bread, rice and pasta. They become high in fat and calories when eaten in large portion sizes or when covered with high-fat toppings like butter, sour cream, or mayonnaise. Foods high in starch (also called complex carbohydrates) are an important source of energy for your body. Myth #4: Certain foods, like grapefruit, celery, or cabbage soup, can burn fat and make you lose weight. Fact: No foods can burn fat. Some foods with caffeine may speed up your metabolism (the way your body uses energy, or calories) for a short time, but they do not cause weight loss. Myth #5: Natural or herbal weight loss products are safe and effective. Fact: A weight loss product that claims to be “natural” or “herbal” is not necessarily safe. These products are not usually scientifically tested to prove that they are safe or that they work. Myth #6: “I can lose weight while eating whatever I want.” Fact: To lose weight, you need to use more calories than you eat. It is possible to eat any kind of food you want and lose weight. You need to limit the number of calories you eat every day and/or increase your daily physical activity. Portion control is the key. Try eating smaller amounts of food and choosing foods that are low in calories. Myth #7: Skipping meals is a good way to lose weight. Fact: Studies show that people who skip breakfast and eat fewer times during the day tend to be heavier than people who eat a healthy breakfast and eat four or five times a day. This may be because people who skip meals tend to feel hungrier later on, and eat more than they normally would. It may also be that eating many small meals throughout the day helps people control their appetites. Schedule a brisk walk or hike after a holiday party or meal. Five minutes of exercise is better than 20 minutes of nothing. Ideally you want to exercise twice the amount of calories eaten to ensure consistent weightloss but try to just be consistent with your exercise to begin with. Just keep going! By Christmas, most of the plans to eat less and exercise more have dwindled, and it’s easy to gain a significant amount of weight. One way to monitor your intake over time: Keep track of your daily habits and set weekly goals around food intake and exercise. I’ve been wanting to eat this for a long long time so I decided to make it today. Firstly – it took MUCH longer than I expected so keep that in mind and make it on a day where you have the time required to put in adequate effort. It was well worth it! Add tomatoes, a handful of basil and salt and pepper, cover and let it simmer till it becomes saucy. Add some more tomatoes or water if need be. Once the sauce is finished cover and set aside. I love my niece. She’s so small and adorable! Having seen some cute baby pics online my sister and I decided a frilly tulle skirt would look awesome on the lil bub and I wondered to myself.. how hard can this be? Off to Lincraft I went and bought half a metre of purple tulle and the other things I had at home. Below are the steps I took and the finished product. 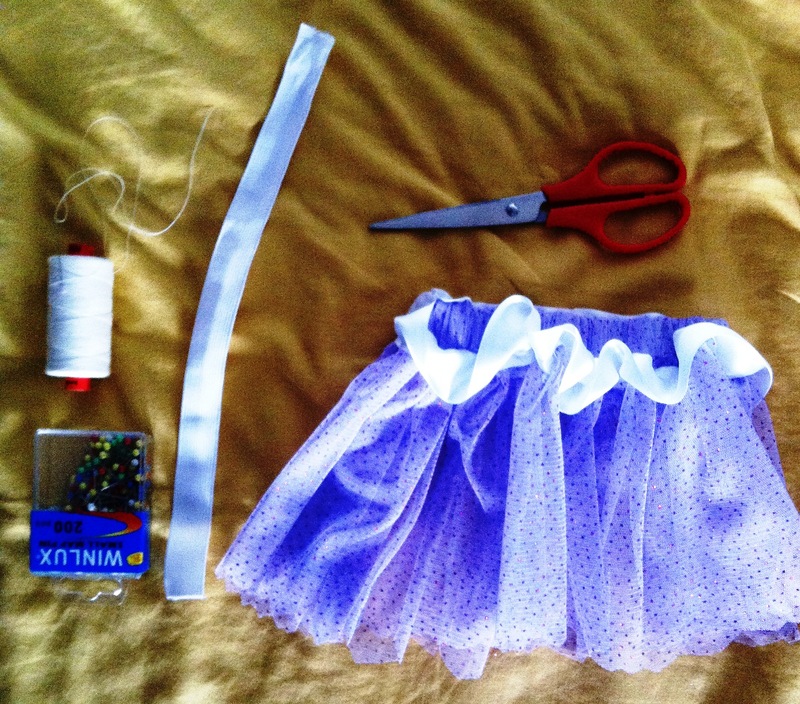 I cut the tulle, elastic and ribbon to my desired size. Pinned the tulle and the ribbon together and just handsewed is all. 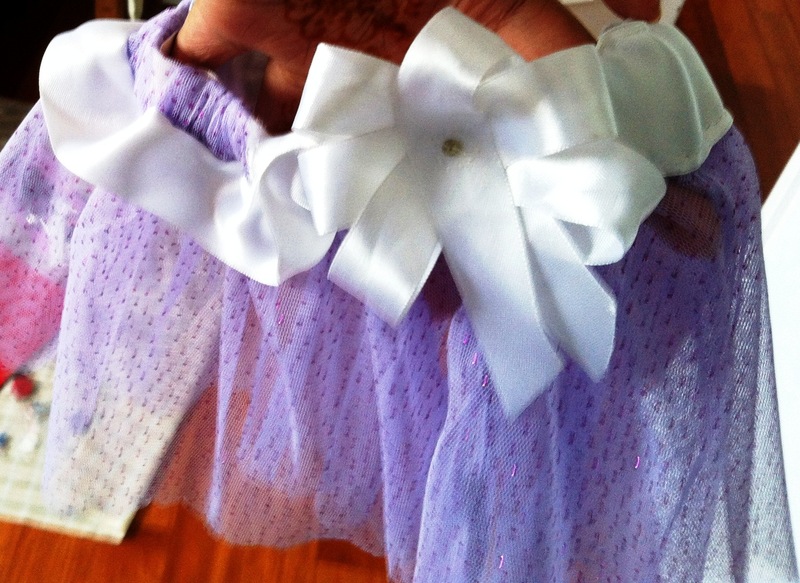 I put ribbon on both the outside and the inside of the top of the skirt. For the outside I ruffled it slightly and for the inside I sewed it securely top and bottom so that the tulle would not scratch her skin where it made contact with her waist. Lastly I cut a jagged edge for the bottom of the skirt and voila! As a finishing touch I made a bow out of white ribbon and sewed it to the back of the skirt with a little sequin in the middle. You can vary this by changing the type of bow as well as the sequin to a pearl or button. Once the skirt was complete I decided to make a headband with a cute flower. 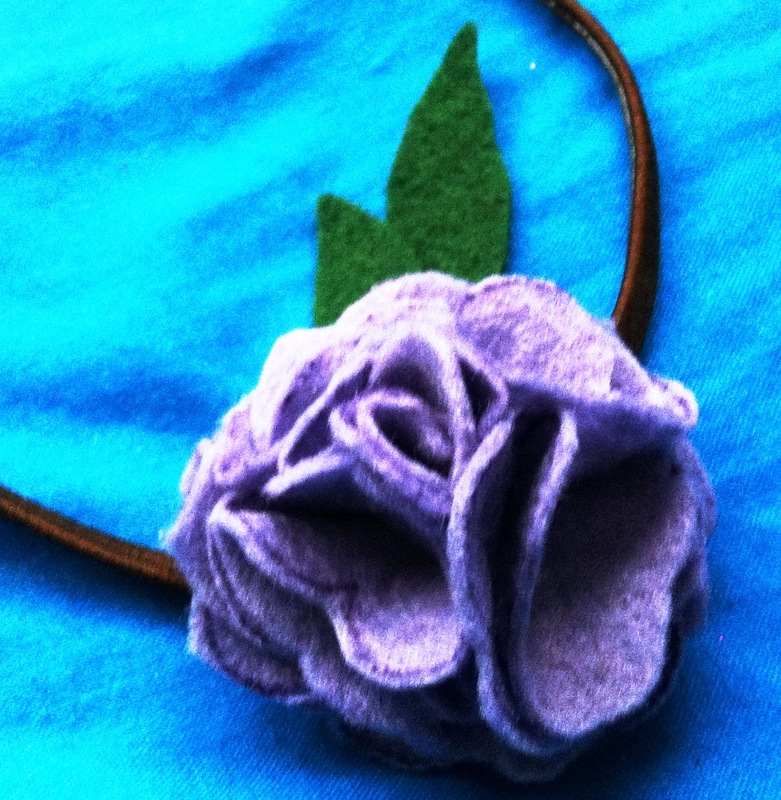 So I went off to my trusty friend Google and found a tutorial on how to make a felt flower. 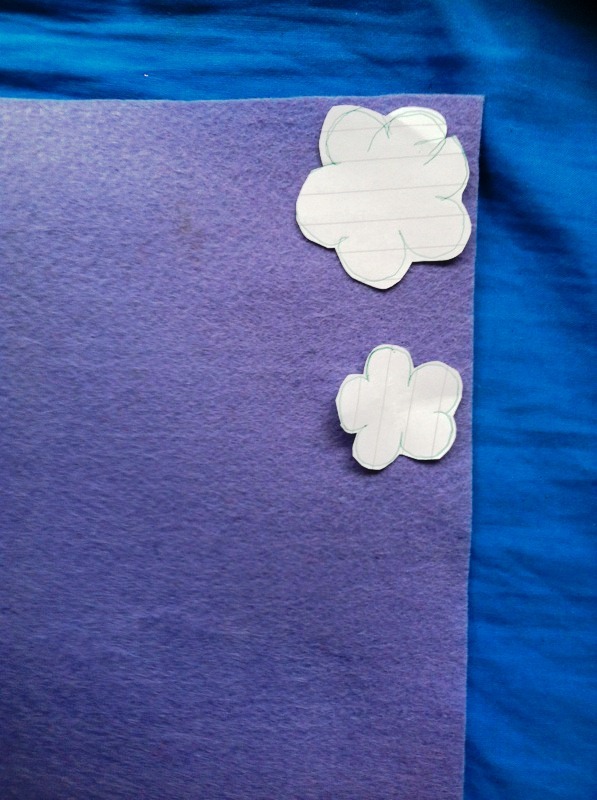 Cut out the paper template and then use it to cut out 9 flowers of felt and one circle about the same size as the flowers. Place the circle flat and take your first flower and fold it in half and then half again. 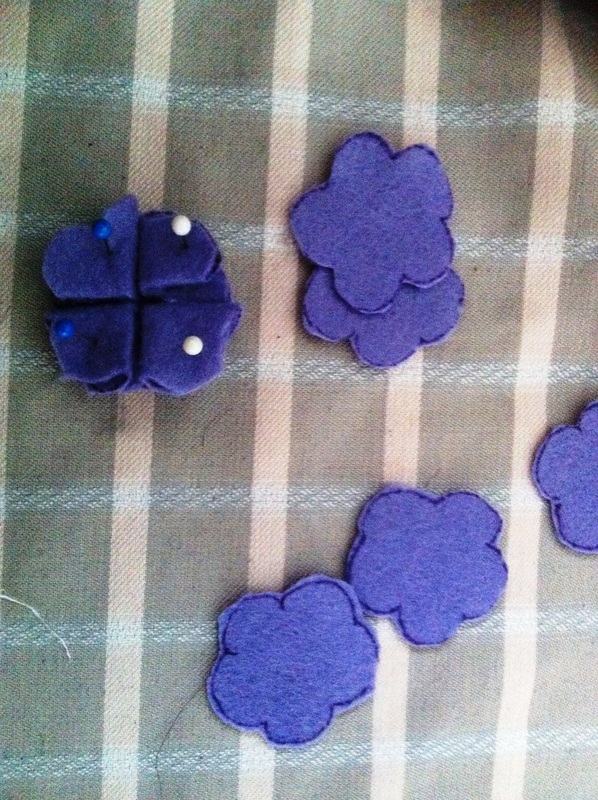 Do this with your first four petals, and arrange them so their corners all meet in the center of the felt circle and it looks like the picture below. 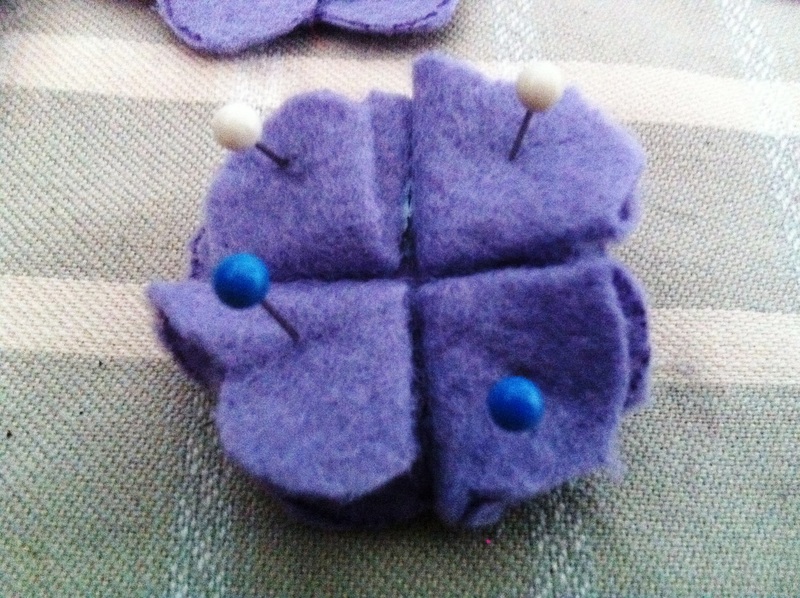 Glue the petals to the felt circle at the base and the folded flaps to themselves. 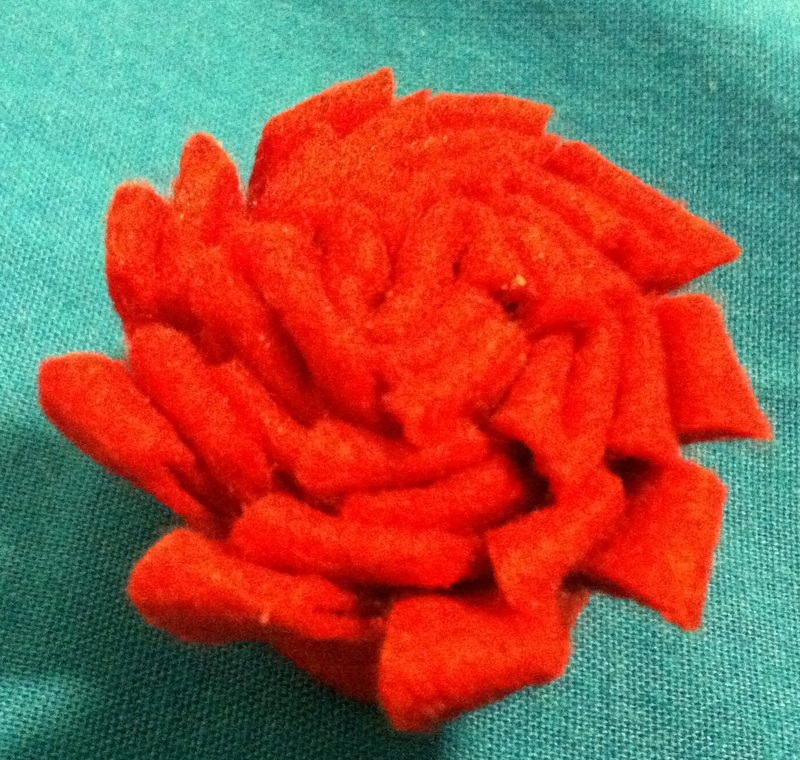 Now fold four more petals the same way, and glue them in a second layer, but semi-perpendicular to the first layer. Fluff up your two-layered flower to begin seeing what the final product will look like. Now for the center take your last flower and fold it in half. This time, instead of folding it again, roll it into acone, with the fold being the narrow part of the cone and the petals being the wide part and glue to the centre of the flower. Glue the petals to the cone and press the whole thing tightly while it dries. While the petals dried, I cut out two leaves and glued them to the side of one petal. I then stitched the whole thing to a thin headband. Voila! All done! It was easy and alot of fun to make. Try it out and let me know how you go!